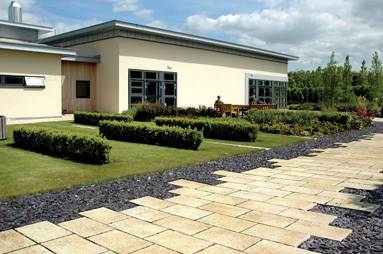 At the new Ministry of Defence (MOD) Andover North site, hard landscaping has played its part in creating sensitively designed, unintrusive grounds for employees to enjoy. MOD Andover North is a new £40m defence logistics facility built on the 30-acre site of a former World War II airbase. All the existing buildings were demolished and replaced with new offices, a warrant officers’ mess and living accommodation designed by Percy Thomas Partnership. Fira has considerable experience in landscape design work for the MOD. 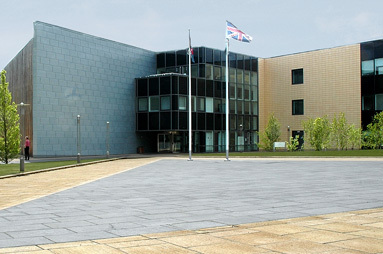 It was involved with the 100-acre Abbey Wood campus in Bristol, an MOD office in Portsmouth and the landscaping for offices and housing at MOD Middle Wallop. 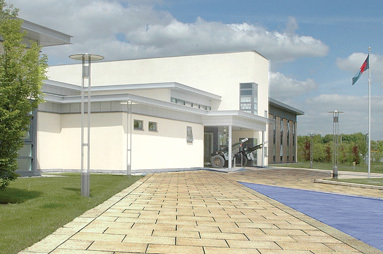 Recently it won the master planning contract for Project Barrington, the defence academy near Schrivenham. The Andover North site is on the edge of downland and the brief called for an ecologically sensitive scheme of high design quality. The materials used needed to be of the highest quality in all the principal public spaces so Fira chose to make extensive use of handcrafted, natural coloured Blanc de Bierges products throughout. Modern geometric shapes are used to reinforce and focus on entries: for example, the triangular plaza outside the entrance to the office building. 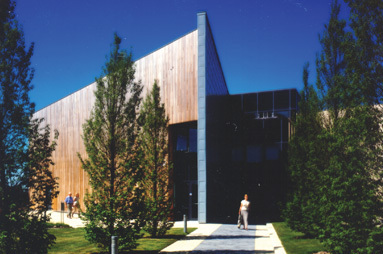 In addition, the trees close to the buildings are clipped into a box shape, reflecting the formal lines of the planting and hard landscaping. Findlay had used Blanc de Bierges materials on a number of previous projects and was familiar with their quality and flexibility. She also felt that they would be ideal for this project because of their ‘crisp and clean appearance’. 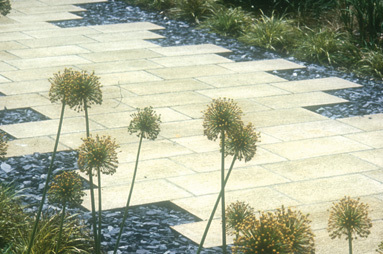 Blanc de Bierges paving setts and slabs in a dozen different shapes and sizes, including radial slabs, feature in the project. 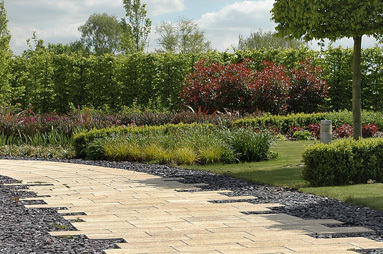 Some of the paths have been created from slabs laid in what appears to be a random manner to give an interesting, jagged edge. In addition, Blanc de Bierges developed a special kerb unit for the edges of the raised lawns – an important aspect of the project.